The Consumer Price Index (CPI) rose 2.2% on a year-over-year basis in September, following a 2.8% increase in August. 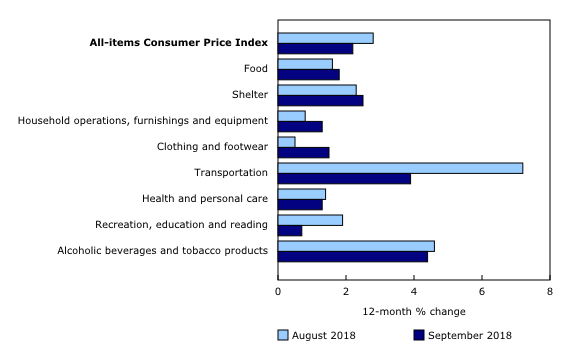 Month over month, the CPI decreased 0.4% as transitory pressures from the gasoline, air transportation and travel tours indexes, which boosted the all-items CPI in July and August, eased. Prices were up in all eight major components in the 12 months to September. The transportation index increased at a slower pace in September (+3.9%) than in August (+7.2%), but remained the largest contributor to the year-over-year increase. Prices for durable goods rose 0.2% year over year, after increasing 1.1% in August. 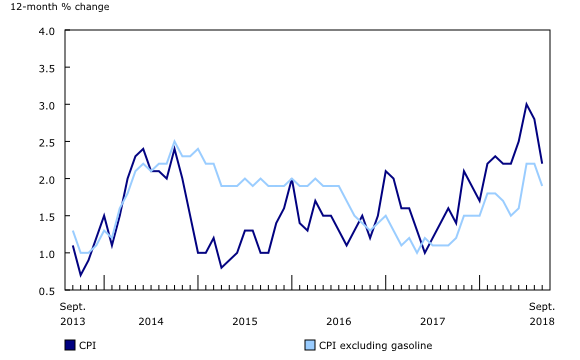 The purchase of passenger vehicles index (+0.6%) rose less on a year-over-year basis in September than in the previous month (+2.3%), which was largely attributable to the lower availability of new model-year vehicles compared with the same month last year. 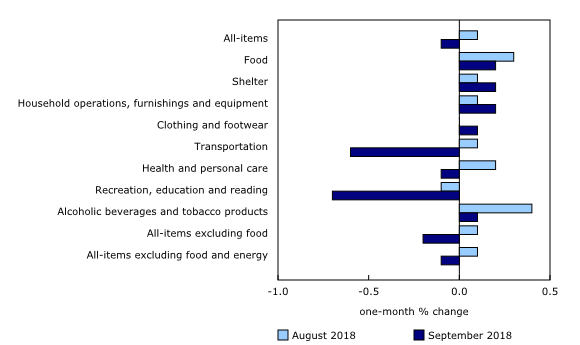 Year over year, prices for non-durable goods (+3.0%) increased at a more moderate pace in September than in August (+3.8%). Gasoline prices were up 12.0% in the 12 months to September, following a 19.9% increase in August. Supply disruptions in the wake of Hurricane Harvey, which drove up prices at the pump in September 2017, no longer affect the 12-month movement. The price of services (+2.5%) increased more slowly on a year-over-year basis in September than in August (+3.1%). The cost of travel decreased on a month-over-month basis in September, with air transportation (-16.6%), traveller accommodation (-6.2%) and travel tours (-3.4%) registering monthly price declines. 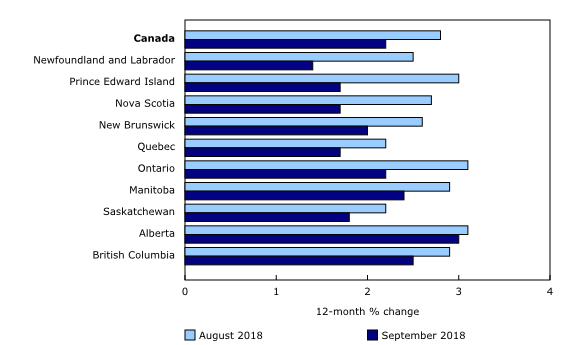 Prices rose less year over year in every province in September compared with the previous month, with price growth decelerating most in Newfoundland and Labrador (+1.4%), Prince Edward Island (+1.7%) and Nova Scotia (+1.7%). Year-over-year growth in consumer prices for fresh vegetables slowed in all four Atlantic provinces, while increasing at a faster rate on a national level. On a seasonally adjusted monthly basis, the CPI declined 0.1% in September, following a 0.1% increase in August. The seasonally adjusted transportation index (-0.6%) and recreation, education and reading index (-0.7%) contributed the most to the decrease. The November 2018 release will reflect changes in methodology for the telephone services index, as well as the introduction of new data sources for pricing smartphones to improve the overall quality and relevance of the index. Users should note that changing methodological elements of any index may result in variations in the series. As such, the interpretation of the 12-month price change indicator should be made with caution, particularly in the year following the implementation of a new methodology. Real-time data table 18-10-0259-01 will be updated on November 5. The Consumer Price Index for October will be released on November 23.